While I'm saddened that we are seeing a slow decline in the addition of summer clothing and accessories, I'm also excited by the fact that there are so many sales in progress. Following are some of the shoes that I've purchased this past week and One particular pair that I couldn't find in my size....darn it! When I first saw this Dolce Vita Shoe among the spring offerings, I didn't really warm to them. I just happened to be browsing through Marshalls this week and there they were on display....I immediately changed my mind about them! As I dug through the boxes, the largest size that I could find was a nine. I'm usually a nine, but when I tried the shoe on, I had a little "toe over hang." Of course that wouldn't do, so I had to leave without them. 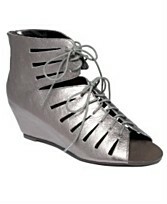 They do have them at Macy's for $89, but the ones at Marshalls are just $39.99....darn the luck! 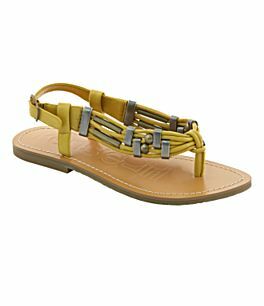 I ordered these Nicole Millers from J.C. Penney.....the stores in my area were all out of this color. They call in "black," but as you can see, it's more of a pewter. Drawn by the stud detail, I purchased this pair from Burlington....The look so.....good on! 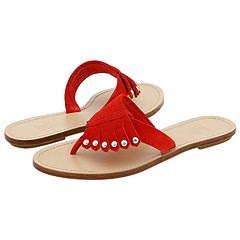 This is pair that I bought from T.J. Maxx yesterday. They were only $16.99, but to me they look much more expensive.....especially with all of the detail. This pair and the next are both by Rocket Dog and I found them yesterday at my favorite store for $9 each. I needed a more casual, gold metallic pair and these certainly fit the bill. The other pair caught my eye due to their kind of, rustic and distressed look. They are super, super, comfortable!